I feel that now, we expect this as a matter of quality, unlike in the past, we are very much aware of the processes and ‘tricks’ that go into cinematic media, is this linked with our increasing involvements with producing and distributing our own media and technological accessibility or the ‘Prosumer’? Exploring the experiential shifts from previous technologies and cultural forms [Shocks] -> 3D, IMAX Cinema etc. Dioramas & Tableaux… -> Daguerre type photography, [Interlinkages between film, art and painting with light, theatre; all used to create immersive and 3D appearance] -> Manipulated to simulate the changing seasons. Panoramic Forms & The Everyday… focusing on the ‘every day as a valid object of representational attention’, focusing on the every day as a form of scientific enquiry [New attention to detail, accessing information about movement that would be impossible to witness with just the human eye alone]. The Panoramic Entails… Vignettes, scenes, views, fragments: ‘An Objective overview of phenomena constituting the everyday experience’, Habits, Manners, Descriptive of newly observable, detail, the wandering gaze. Singer, Ben (1995) ‘Modernity, Hyperstimulus, and the Rise of Popular Sensationalism’ in Leo Charney and Vanessa R. Schwartz (eds.) Cinema and the Invention of Modern Life, Berkeley and Los Angeles, California University Press. Modernity, trains, industrialisation, Speed, Shock, Hyperstimulus, Sensationalism. Surely there are connections that still exist today? Why do we have such a fascination with horror, gore and death? An interest in the dynamics and physics of movement, speed etc. The combination of different media forms in an attempt to physically immerse audience members within artificial spaces in a manner that invites active involvement within their surroundings. 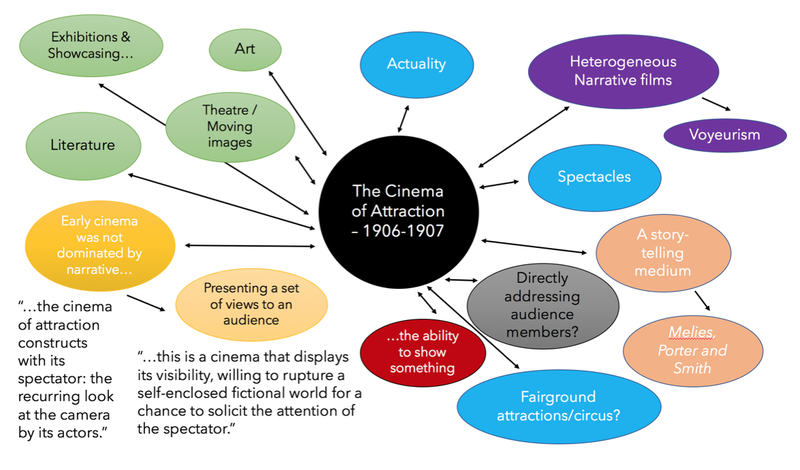 Gunning, T. (1986) ‘The Cinema of Attractions: Early Film, Its Spectator and the Avant-Garde’, Wide Angle, Volume 8. Nos 3 & 4. Anderson, C. (2012) ‘The History of the Future’ and ‘Epilogue: The New Industrial World’ in Makers: The New Industrial Revolutions, London: Random House, pp 33-52 and 225-230.